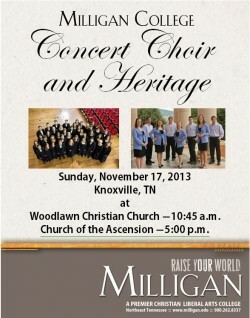 MILLIGAN COLLEGE, TN (Nov. 11, 2013) — The Milligan College Concert Choir and Heritage will perform twice this weekend in Knoxville, Tenn.
For their first stop, the groups will participate in the 10:45 a.m. worship service on Sunday, Nov. 17, at Woodlawn Christian Church. The church is located at 4339 Woodlawn Pike, Knoxville. Later that day, they will present a 5 p.m. concert at Church of the Ascension, located at 800 S. Northshore Dr., Knoxville. Accompanists for the choir will be Dr. David Runner, professor of music, on the organ and Amanda Eversole, a junior music education major, on the piano. Milligan’s Concert Choir is an auditioned mixed chorus of 43 students with a varied repertoire that includes classics, spirituals, hymn arrangements and multicultural music from around the globe. The students in the choir represent a variety of majors, including a number of students who are music majors or minors and who plan careers in music education or ministry. The Milligan Concert Choir upholds a long tradition as an outstanding college choir. At the invitation of the president, the choir sang at the National Prayer Breakfast in Washington, D.C., and toured throughout England, with special performances in Coventry Cathedral and in the Civic Centre of the City of Birmingham. More recently, the Milligan College Concert Choir sang at the Conference on World Evangelism-National Missionary Convention and the Tennessee State Convention of the American Choral Directors’ Association. Also, the choir frequently collaborates with the Symphony of the Mountains, the Johnson City Symphony Orchestra and the Milligan College Orchestra. The Milligan Concert Choir is under the direction of Noah DeLong, assistant professor of music. DeLong, who joined Milligan’s faculty in fall 2011, has conducted choirs at a number of churches and colleges, including The University of Iowa, Good News Bible Church (Iowa), Earlham College (Indiana), Ball State University, Westminister Presbyterian Church (Indiana) and Taylor University. In addition to his teaching and conducting experience, he has performed as a tenor soloist and accompanist for numerous choirs and solo vocalists. Heritage is a select a cappella vocal ensemble and is Milligan’s premier traveling ensemble. The group keeps an active performance schedule representing Milligan at churches and other civic organizations throughout Eastern Tennessee and across the United States. Directed by DeLong, Heritage performs music in a variety of styles, including sacred, vocal jazz and pop a cappella. The eight members of Heritage are: Nate Andrew, Ben Davenport, Amanda Eversole, Lindsey Kyker, Jonathan Mehl, Laura Mixon, Amber Vaughn and Lukas Williams. To learn more about Milligan College, visit www.milligan.edu or contact 423.461.8723. Posted by tommy on November 11, 2013.